The Tiller Girls performed the opening routine on the 2014 John Bishop Christmas Special, getting the entire audience and viewers at home into the Christmas spirit, with spectacular, sparkling costumes coupled with the fine vocals of The Overtones. In true Tiller tradition, there were high kicks and a sprinkling of Hollywood choreography, with the emphasis on precision dance and timeless glamour. 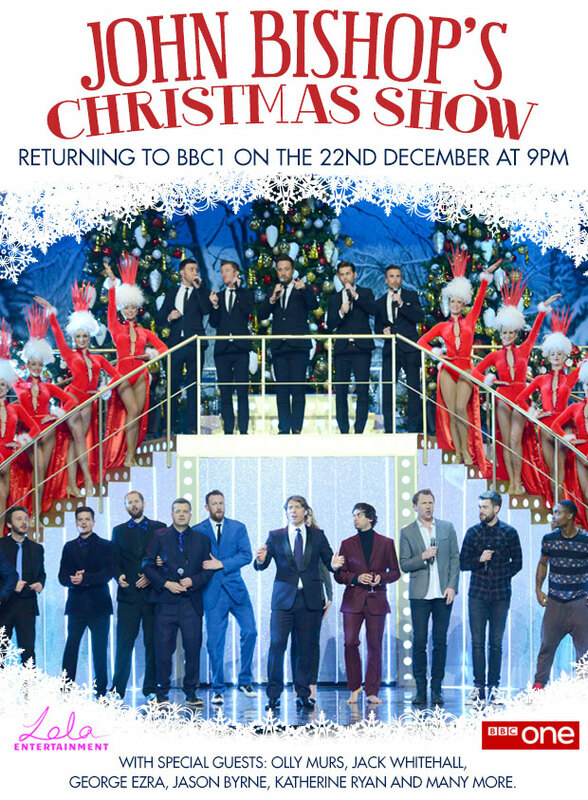 The Christmas spectacular, broadcast on BBC One at 9pm on the 22nd December 2014, also featured The Tiller Girls and “Bishops Boys” (John Bishop and fellow comedians Jack Whitehall, Jason Byrne and Simon Webbe), joining forces for a hysterical dance routine where the boys joined the impressive kicking line-up. Festive hats off to John Bishop who didn’t even have to wear a Santa suit to get Kylie Minogue on his knee.